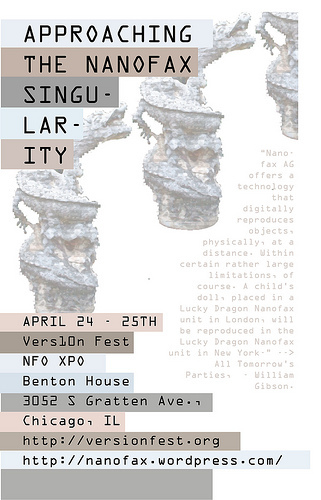 Please join us for a series of presentations addressing the theme of digital fabrication on Sat April 24th from 3 – 6pm at the Version Fest, NFO XPO / Free University. 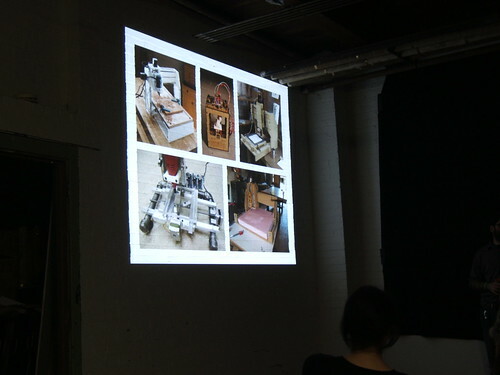 Margarita Benitez will talk about her new project osloom an open source jacquard loom she is currently developing. DIYLILCNC ( Chris Reilly and Taylor Hokanson) will demonstrate their CNC machine and talk about CNC technology in general, some of the shortcomings of the present state of CNC and how those are addressed by open-source hardware projects like the DIYLILCNC. They will also go over the specs of the DIYLILCNC, giving details about how it is built and its functions. (f)utility projects ( Paola Cabal, Michael Genge and Christopher Grieshaber) will talk aobut their ucrrent project at ATNS and previous projects including Depth of Field currently on view at SubCity Projects in Chicago. Mik Kastner and Brian Matthew are members of the Bio Art Research Network they will talk about their “bio printer” a rapid prototyping machine that will produce organic sculptures from plant and animal cells. 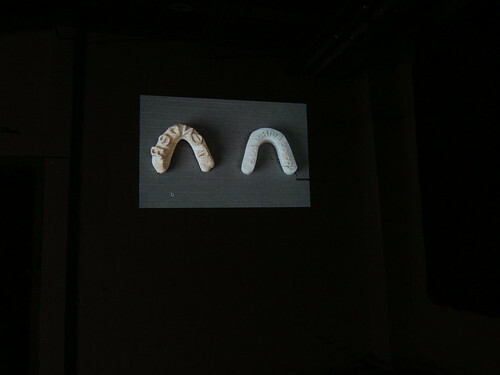 Dan Price will discuss his work which combines sculpture, performance and experimental documentary practice. . Approaching the Nanofax Singularity a symposium and curated exhibition project addressing digital fabrication and open source technologies as a component of NFO XPO, Free University and the Infrastructure aspect of Vers10n Fest. 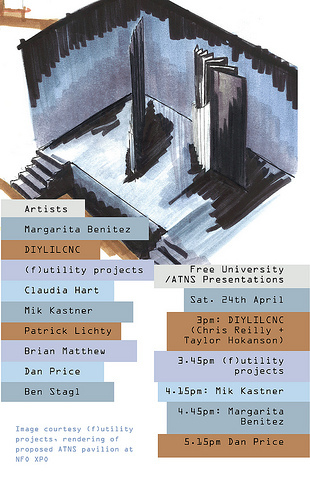 Featuring Margarita Benitez, DIYLILCNC, (f)utility projects, Claudia Hart, Mik Kastner, Patrick Lichty, Brian Matthew, Dan Price, Ben Stagl curated and organized by Tom Burtonwood. From All Tomorrow’s Parties, by William Gibson. The theme for the tenth edition of Version Fest is Territories and Infrastructure. Infrastructure is represented in our lives by fiber optic cables delivering the data that keeps us trucking. It is the faucet delivering water to our house, the asphalt we drive on, the flight plan our pilot takes. Infrastructure is the bridges, the networks, the grocery stores. It is the logistical machine the keeps modern life rolling on. But infrastructure is not just the pipes, and the tubes, and the faucets that deliver culture, but the material and methods that manufacture those pipes, tubes, cables and what not. Infrastructure is the tools we use to create. Recently a new raft of technologies have entered the digital domain, these tools for replicating and manufacturing have already rapidly changed the way we think about producing things. 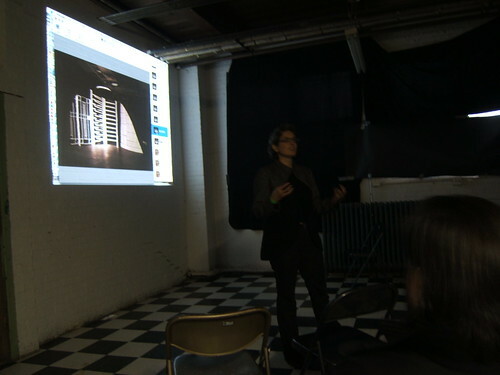 For artists today these techniques and methods represent a new infrastructure. Approaching the Nanofax Singuarity is a two day symposium featuring presentations and exhibits by artists and designers utilizing the latest techniques in digital fabrication and replication. Hardware once the sole domain of engineers and scientists have become much more accessible in the last five years. Advanced by open source technology, dedicated hacktivists, tinkerers and homebrew engineers have brought this infrastructure from the lofty heights of the machine shop into the alt space network. Now it is possible for designers with a small budget and workspace to utilize tools and equipment such as 3-d printers, RepRap, CNC machines, 3-d scanners, laser cutters and so forth. So whether it’s making the tools to make the art, or making the art with the tools we’ve made, or making the art with open source tools, there exist many possibilities and options for designers and artists to interact with new digital fabrication techniques. Approaching the Nanofax Singuarity (ATNS) seeks to show case some of these artists currently working in this field here in Chicago. Margarita Benitez works with fiber, sound and technological components in her practice, she will talk about her new project osloom an open source jacquard loom she is currently developing. 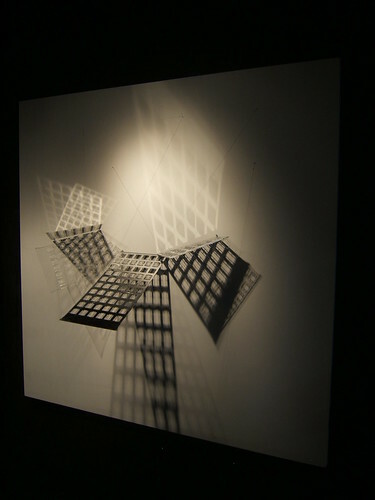 DIYLILCNC is a collaborative project by artists Chris Reilly and Taylor Hokanson. 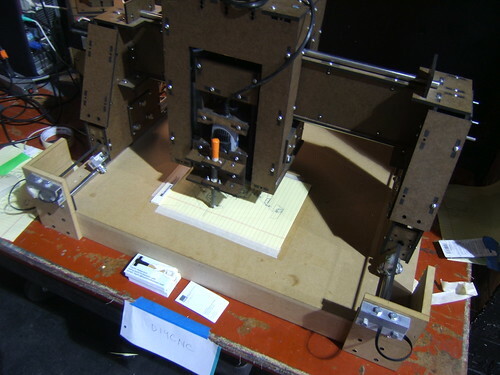 Their project is a low cost open source DIY 3 axis CNC mill. Chris and Taylor will demonstrate the machine and talk about CNC technology in general, some of the shortcomings of the present state of CNC and how those are addressed by open-source hardware projects like the DIYLILCNC. We’ll also go over the specs of the DIYLILCNC, giving details about how it is built and its functions. (f)utility projects are a collaboration between Paola Cabal, Michael Genge and Christopher Grieshaber. 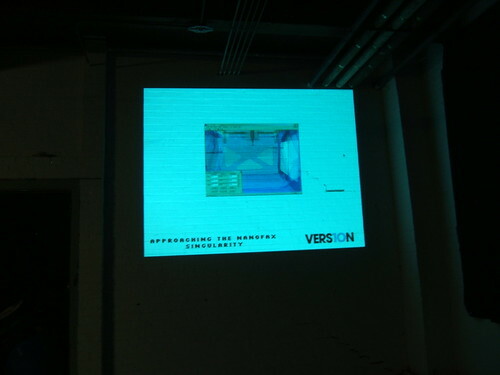 Previous projects include Depth of Field currently on view at SubCity Projects in Chicago. (f)utility projects will be producing the ATNS pavilion at the NFO XPO. The pavilion will host exhibited projects by ATNS artists. Claudia Hart produces designs for sublime landscape gardens often containing expressive and sensual female bodies meant to interject emotional subjectivity into what is typically the overly-determined Cartesian world of digital design. Mik Kastner and Brian Matthew are members of the Bio Art Research Network they will talk about their “bio printer” a rapid prototyping machine that will produce organic sculptures from plant and animal cells. Patrick Lichty is a technologically-based conceptual artist, writer, independent curator, animator for the activist group, The Yes Men, and Executive Editor of Intelligent Agent Magazine. 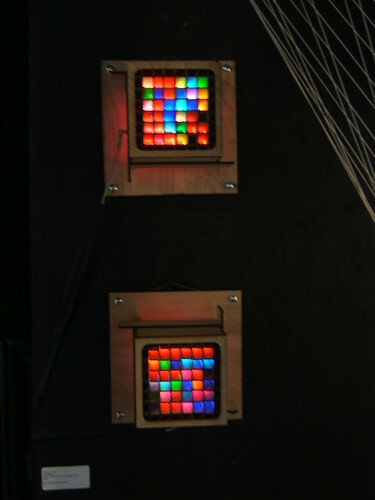 Lichty will exhibit his Pixelbox series, laser cut LED pieces whose simple appearance belays an experiment in emergent behavior. 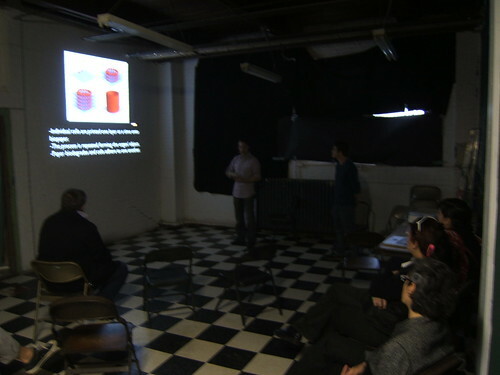 Dan Price combines sculpture, performance and experimental documentary practice. His current project Tentacle Shelter will be a wearable “shelter” for a child – like a costume/cape/tent produced in thick felt. For ATNS Price will exhibit a laser cut model and prototype for the shelter. Ben Stagl investigates urban space through a variety of mediums including sculpture, performance, video, and installation. Stagl is largely concerned with how human beings continue to address and experience shared spaces. Many of his projects explore ideas of inclusion through object, often involving collaboration and elements of participation. 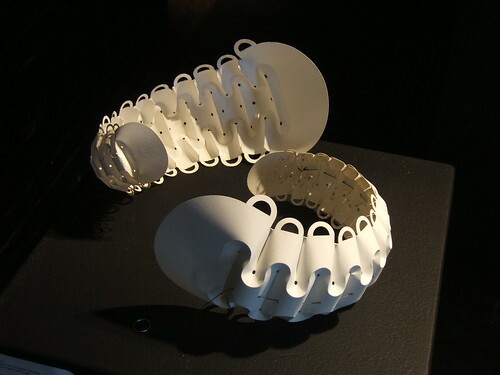 Taken together these artists articulate both sides of the coin in terms of digital fabrication. Whether their project is to make the tools of production and distribute them freely to others. Or take up these tools and create new works via the CNC machine, bio printer, rapid prototyper or the laser cutter their work is at the leading edge of modern manufacturing techniques. The universe is hacking, it’s software, it’s mobile web, it’s rapid prototyping, it’s hardware hacks, the idea of digital infrastructure for artists and designers just goes on and on. The recent article in Wired by Chris Anderson points to this momentum and suggests that what Kinkos was to the 80’s and 90’s so rapid prototyping and it’s various cousins will be to the tens or whatever this decade is going to be called.